As we seek to glorify God, the Psalmist instructs us to make a joyful noise! Music is an important way we do this during worship. 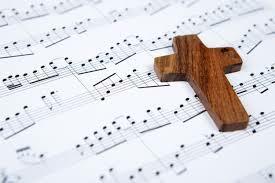 We employ a blend of traditional and contemporary music, singing both hymns and praise songs during most services. It is important to enjoy both old musical favorites and new expressions of our faith — almost anyone can find something to like as they meditate on the day’s message. In this way, we will never stop growing, either spiritually or musically. We like to emphasize participation, and seek to highlight the talents of church members and those in our community. On any given Sunday, in addition to congregational singing, you might encounter performances from the choir, handbells, or other instruments. The music ministry offers rich opportunities for fellowship. Nothing draws us into community closer than the joy of preparing to lead worship. The choir is an integral part of weekly worship. The choir leads all congregational music and offers periodic special music. Anyone is welcome to join, whether for a trial rehearsal or to claim preferential seating in worship. No previous musical knowledge or experience is required; only a good attitude and a willingness to learn. The choir rehearses on Wednesday evenings at 7:00 PM and warms up on Sunday mornings at 8:50 AM. For more information, contact Sam Brannon. The worship band is a group of dedicated church members that provides musical accompaniment as needed throughout services. We regularly feature piano/keyboards, bass, and drums, but always welcome other musicians (especially guitarists) no matter their level of skill or availability. The worship band typically rehearses Sunday mornings at 8:50 AM. For more information, contact Sam Brannon. The New Hanover Ringers is a group of musically eclectic individuals united for a common purpose – to ring for the glory of God and provide musical offerings to the congregation. We currently ring two octaves of Malmark bells and handchimes, but have room for more members, as the church owns three and a half octaves. No musical experience is necessary, but you should be able to commit to rehearsals on a regular basis. The New Hanover Ringers rehearse on Monday nights from 7:00- 8:00. For more information contact Pam O’Brien.